I can’t believe it’s been almost 9 months since I last posted here, an entry in which I promised to write about our amazing visit to Istanbul. And I’ve tried, really I have. But each time I sat down and tried to write about our trip, there were so many competing images and thoughts, emotions and memories, I just didn’t know where to start. And in the passing months, as Rob and I have watched with sadness and horror at the events unfolding in the beautiful city we so recently visited, it hasn’t made it any easier to put my thoughts and feelings into words. So, instead, I’ll start with my second love, after travel…the food. As long as we’ve been traveling (since 1998), we have rarely, if ever, been somewhere we haven’t discovered some wonderful new tastes. I mean, who wouldn’t fall in love with a crepe or a steak frites in Paris, or a great Guinness stew in Ireland? Moroccan tagines, nacatamales in Nicaragua, Hungarian paprikash, tapas in Madrid…they were all delicious and opened our minds and palates to new flavors, and ideas about how people saw their food. But Istanbul? If it’s true that you understand a place through it’s food (and I sincerely believe that to be true), then I am in deep, deep love with Istanbul. 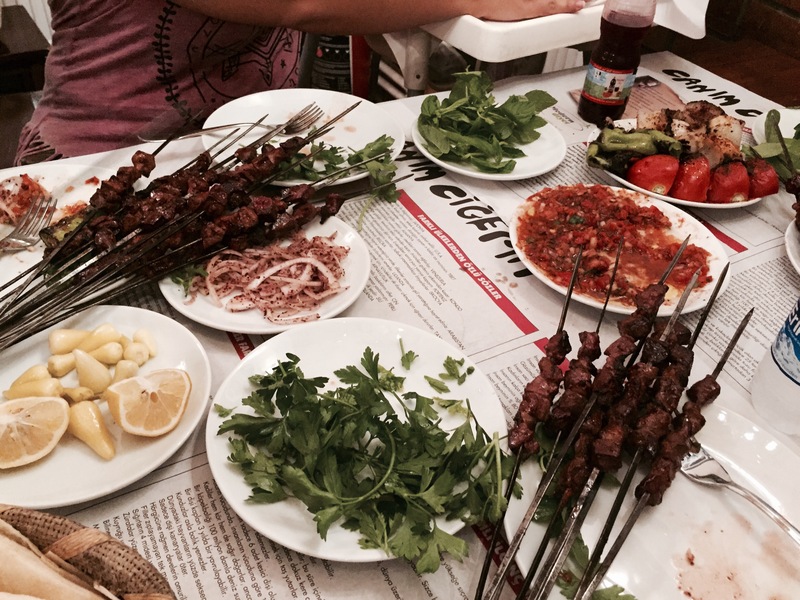 There are not enough superlatives to describe how much we enjoyed every single meal in Istanbul. In ten days of eating, we simply didn’t have a bad meal. And I’m not talking fancy food, or restaurants. Other than one splurge meal, we were eating either street food, or in small mom-and-pop joints, or very casual, neighborhood restaurants, no white tablecloths. Where people of all ages ate with friends and family. Grilled, freshly caught seafood at one of the restaurants along the bridge; a durum from a street vendor in the Egyptian market; skewers of liver and heart at an out of the way, locals-only place our new Turkish friends brought us; baklava that was dripping with honey and so incredibly fresh; a dinner of meze and raki at a bustling, popular meyhane; the savory borek we learned to roll up in phyllo dough in our cooking class; kaymak, a lightly sweet cheese drizzled with honey, and one of the traditional items in a Turkish breakfast. Even going back to the first night, after a long day of travel, and our first taste of Istanbul–on any vacation easily the meal that is most at risk of being a total garfunkel–we managed to find the most delicious, smooth hummus, and manti, those tiny, savory meat dumplings served with yogurt sauce, at a tiny bar/cafe right in our neighborhood. The pictures simply don’t do it all justice, but here are a few that captured the feel of eating in this lovely place. This list is not exhaustive, because there are a few places we simply can’t remember the names of, and in 10 days there was a LOT of food, but is representative of our favorites, and I promise you won’t be disappointed with any of them. Around the corner from the apartment we rented in Cukurçuma, we ended the night here almost every night for a final glass of vino. But we did also enjoy food here a couple of times, including the aforementioned manti and hummus. A place we never would have found on our own, this little shop seemed to make one thing, and one thing well: shish kebab, skewers of grilled meat served with warm, soft flatbread, crisp onions, tomatoes, cilantro and hot peppers for dressing as you liked. A delicious, casual meal. Meyhane are everywhere, but this one was right in our neighborhood. Our friends told us we arrived at a good time, when hamsi season was just starting, so of course we ordered that, along with many other small plates, and the obligatory raki. Near Taksim but far enough off the beaten path to not be crowded. Just a counter takeaway, with plastic tables & chairs out on the sidewalk. A dürüm is a wrap, typically filled with some type of kebab, along with tomatoes, onions and parsley or cilantro, and quite common street food. We had several while there, and this place was easily the best. Our Turkish friends brought us here after a long day of sightseeing at the Blue Mosque and the Hagia Sofia. Really, truly delicious fasuli (beans)–I know that doesn’t sound like much, but they are in the name of the place for a reason. Most people who have been to, or even seen photos of, Istanbul, are familiar with the colorful, bobbing and very popular (and touristy) fish boats near Galata Bridge, on the side where the major tourist sites are. However, locals line up on the other (Karakoy) side of the bridge, where several guys cook up fish on makeshift grills set up over concrete or even plastic blocks, douse them in pomegranate molasses and then stuff them inside a crusty roll with sliced onion, tomato and parsley. We stood with a mixed crowd eating in a parking lot and marveling how with every bite, juices running down our arms, we paid a couple of dollars for one of the best fish sandwiches we’d ever had. A splurge meal on our last night. The service was unbelievably good and subtle, the food excellent and the wine pairings spot on. I wouldn’t hesitate to go back if I am ever in Istanbul again (and I do hope to be someday). We managed to find this below-street level wine and cheese shop after a lot of false turns, mostly because it was unmarked, unless you knew exactly where to find it, tucked away in the basement level of a hotel. But we were glad we persevered, because we had one of the most delicious wines of the trip here, along with some superb Turkish meats and cheeses. An excellent place for Turkish breakfast, conveniently located in the neighborhood we were staying. If you’re ever in Turkey, you have to do a full Turkish breakfast at least once (it’s an event!). I can’t remember all of the different places we visited on the walking tour we did of the Egyptian (aka spice) Market, but I would highly recommend this company. Our guide was Gonça and every place she brought us had delicious food. We were stuffed by the end of the tour. I feel like I’ve left out so much. And to be honest, we were so enthralled with our time there that we neglected to take photos of everything. Istanbul is definitely a place you can just get lost in, and feel like you’re a part of, while you sit at a cafe or walk through the markets. There will be more posts on Istanbul for sure. I still need to tell you about the sights and sounds, the markets, our lovely neighborhood, the hammam…and the cats. All the cats. But before that, we’re heading off to our next food adventure tomorrow…the Big Apple!